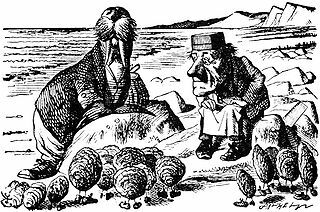 From Wikimedia Commons: A scene from "The Walrus and the Carpenter", by Lewis Carroll, drawn by Sir John Tenniel in 1871. I'm breaking my self-imposed vow of silence for a brief moment. The last couple of months have been insane, but resolution is near. We accepted an offer on our house in Wisconsin and are in the process of finalizing arrangements to purchase one in a small town in Delaware. If all goes well, in a couple of weeks I'll be driving across the country with the dog, to join the rest of the family already in Delaware. Meanwhile, my book will be coming off Kindle Select tomorrow. This means that it's no longer exclusive to Amazon. When I get a chance in between packing, cleaning, and other preparations for moving, I'll make the e-book version available through other channels, including Kobo, iBooks, and Nook. Once I get settled in Delaware, I hope to increase my involvement online (and do more writing!). I'll also need to build up the other side of my writing career--the one that pays the bills. Stay tuned.